The Prospect Historical Society is proud to announce the election of a new president, Carol Brooks. 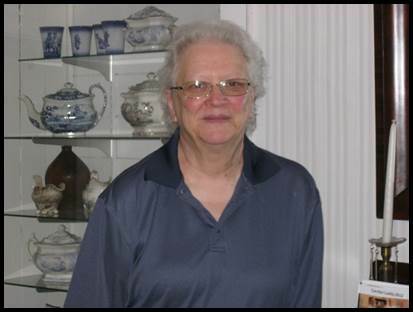 Carol is a lifelong resident of Prospect and truly her heart lies in preserving the history of one very terrific town! She has volunteered her time as vice president for the past few years and was a contributing member before that since 2012. Carol is very involved in many town activities and willingly gives her time to many great projects. Carol is vice president of Friends of the Prospect Library. She is the vice president of the Prospect Grange #144 and a corresponding secretary of the Lady Fenwick Chapter of the Daughters of the American Revolution. She is a member of several other historical societies and became most active upon her retirement from work. She also is a member of the Prospect Senior Center. Carol grew up on her family farm with her mom and dad and two brothers. Her dad actually built the house she lives in since childhood. This was known as the Rasmussen-Brooks property on Straitsville Road. She attended Algonquin School, Community School, Wilby High School, and Naugatuck Valley Community College. She had worked in several places as an assembly or Quality Control Inspector. Her further education was related to her being qualified for these positions. She had worked for forty-five years either in Lewis Engineering, Robert Shaw Lux Company, and Winchester Electronics. Being raised on a farm gives her a great interest in animals. She enjoys traveling. Her interest in reading has brought her to the Prospect Historical Society American History Book Club where she participates with a group discussion on American history books. She is credited with helping or speaking about various historical programs for the society. She has catalogued items in the Hotchkiss House and Barn, a museum of the Prospect Historical Society. She spoke to all Prospect Elementary School third graders about the contents of the barn for the past 5 years. She is knowledgeable about the farm equipment used on the farm which sold eggs and crops. As president, Carol hopes to preserve and share the history of Prospect. Her wishes are that others will develop their sense of love for this town and continue to make it a wonderful place to live, work, and play together. She will continue to record our heritage of Prospect and provide opportunities to enlighten the public about Prospect. A Vintage Quilt Show is being planned by the Prospect Historical Society for October 1, 2017. A quilt history program will be presented and a collection of quilts from the Hotchkiss House Collection will be on display. The Connecticut Community Foundation has generously given a grant to help the society with this scholarship fundraiser. Please consider joining us on this day.